My life now revolves around Wonder Pets. It is quite a sad realization. Lenny, Tuck, and Ming Ming too, they all work together and they'll help you. Wonder Pet songs are in my head. All.day.long. Oh dear. So when the next muffin tin 'no theme' day came up, I decided to do a Wonder Pets theme for Pierce. We've got flyboat fish, Tuck sliced cheese, potato salad, Ming Ming water (you can get these great cutouts with paper doll clothes off the Nickelodeon website), Lenny cream cheese and apple butter bread, and of course ants on a log celery. No Wonder Pets lunch would be complete without celery. 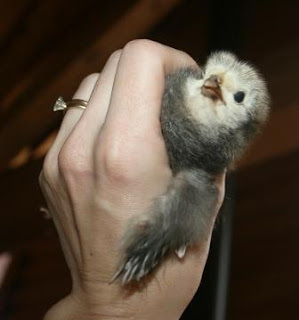 And now for Monday's chick update. Horace and Juliet continue to do well. Only Juliet is looking more and more fryerish. Also, it appears she may be a he. She has a little comb coming up on her head. Horace is working on his wings too. 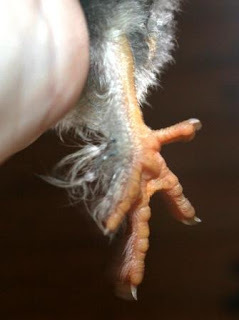 Also, he has the cutest fuzzy legs. Can you stand it? Incidentally, we called McMurray hatchery and told them what happened with our last shipment. So they sent us an entirely new batch of chicks. The post office called at 6:45 this morning and I went to pick them up. 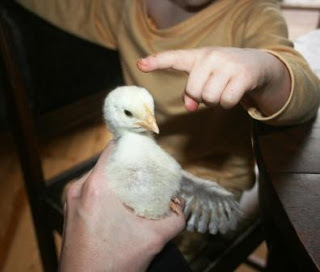 I can't tell you how much healthier these chicks are! 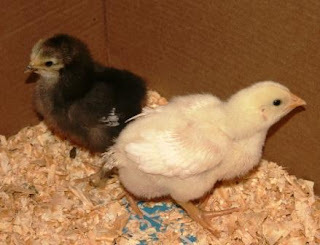 First of all, there were NO dead chicks at all when we opened the box (last time we had almost 10 dead right off). In addition, they are all healthy and peeping and eating. The only chick who seems to be in trouble is one with a broken leg. Hopefully they will fare much better! Awesome!! My kids would love this. They love Wonder Pets. What a great tin! My boys would have gone crazy over that one...we are also Wonder Pets - addicted. I love your creativity! Super Cute! It is all DORA at our house. I will have to do a Dora tin next time there is no theme. Horace is adorable! What an awesome lunch! You are so creative. Love the creativity of yur muffin tin! You did a good job. Good luck with your chicks! 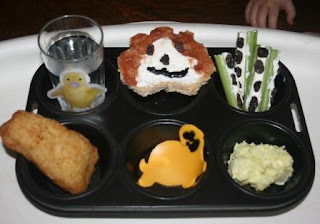 What a creative lunch! It looks awesome. How cool is that! Your kiddos must really love you! Very cute! We love the Wonder Pets at our house too. I find it's one of the least annoying song to get stuck in my head! Good Girl Gone Redneck sent me!! I want in on the Apron Giveaway... too cute!!! Too cute! My boys would love that. Great job. We're just starting out with MTM so she'll have wait until I get the hang of it. That song can stick with you can't it? I think I'm in love with this tin. How cute! Hey there! We love Wonder Pets here, too ---AND I have twins as well! I have twin girls who just turned 4. That is super cute. We love Wonder Pets around here as well and there was a time where it non-stop went through my head as well. I'll have to look for the cut outs. That should be a fun muffin tin for my daughter. ok. love the wonder pets tin. you did a great job with that. also. i have a great time reading about your chicks. yes i do.